Description: If wear resistance and puncture protection are among your top priorities, look no further than the Continental SuperSport Plus. With a tread pattern derived from the race proven Grand Prix, the SuperSport provides reliable traction and excellent handling --rain or shine. 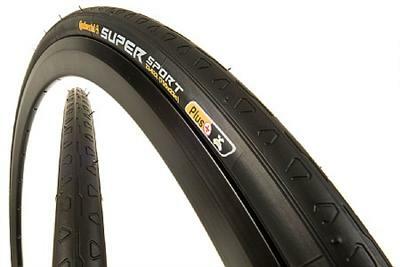 A thicker rubber compound and PLUS protection strip keep sharp objects out, making it well suited for the urban rider or touring cyclist. All Black. Wire bead. 700cX25C (622 ISO).